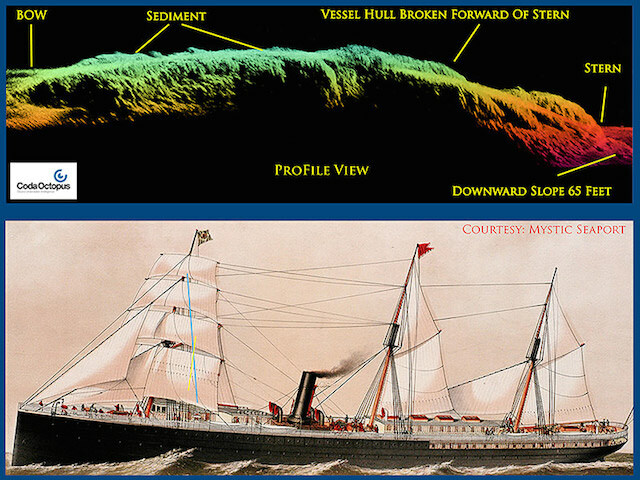 Amid a two-year study of shipwrecks in Farallones National Marine Sanctuary and the Golden Gate National Recreation Area, the National Oceanic and Atmospheric Administration (NOAA) and their partners have released three-dimensional sonar maps and images of a steamship, the SS City of Rio de Janeiro, which was lost at sea over 100 years ago. The steamship's sinking was perhaps the worst maritime disaster in local history and is sometimes referred to as "the Titanic of the Golden Gate." In 1901 the fog-blind vessel struck jagged rocks by Fort Point and sank. 128 souls were lost though local fisherman were able to rescue 82 survivors. Many aboard the ship were Chinese and Japanese immigrants, with the U.S. Consul-General in Hong Kong among the dead. According to a press release from the NOAA, the study comes as new technology promises to turn up more details on undersea historical treasure. So far the NOAA has plotted nine of almost 200 ships, four of which had never been discovered before. Last month, the NOAA received a research vessel and crew plus a high-powered remotely operated vehicle with which to pinpoint and map the wreck site. The incredibly cool sounding technology they used: three-dimensional Echoscope® sonar. Salvagers noticed the wreckage in the 1980s, confusing the NOAA because the coordinates didn't match any wreck charted by the NOAA after years of sonar searching. But now the ship has been located and rendered. It was beneath 287 feet of ocean in the muddy waters near the Golden Gate Bridge. For more flotsam and jetsam about the ship, check out the NOAA page.